Received an e-mail from Peter Graham who is running a Comedy Night in Campbeltown on 29th January 2011 in the Grammar School to raise money for Marie Curie cancer care. Please spread the word. Just to let you all know I've arranged a comedy night in the town on Saturday 29th January at the grammar school to raise money for the climb of Mount Kilimanjaro I'm doing in aid of Marie Curie cancer care. I have a target figure of £4,000 to reach before i do this climb in February so I'm hoping takings from the comedy night will go some way towards hitting my target. The attached poster should have all the details for the event and you may see these in shops and pubs around town. 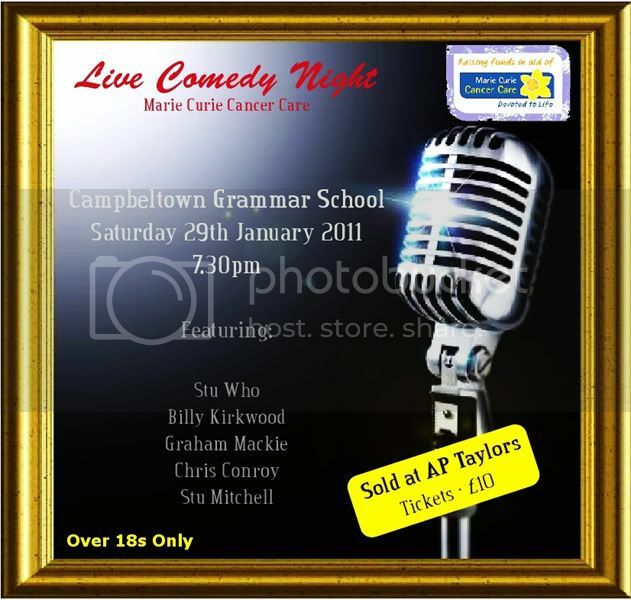 Tickets are £10 on sale in A P Taylors. There will be some music to start the evening and mid-way through there will be a raffle and possibly an auction if i can get some decent prizes. Hope to see you there and I would appreciate it if you would spread the word on this event to try and get as many people through the door as possible. If you can't make the event but wish to make a donation then there is a link to my just giving page below. Please support Peter with his fund raising for a very deserving cause. I know first hand the invaluable work that Marie Curie carries out as they have been involved with my Mums care over the last few months. Please give what you can to ensure that they can continue to provide help and support to other families. fionag wrote: Please support Peter with his fund raising for a very deserving cause. Yes, would echo that too Fiona. Great chap doing his bit for a very worthwhile charity. Just to also confirm this is a licenced event. Can i also take the opportunity to thank locals for the level of interest and support in this event so far. I hope it will be a good night, not just for the charity, but for toon folk also. Just to highlight what will be fantastic event for charity tonight at the Grammar School. Tickets are still on sale and you can pay at the door! Little update from Peter too. Best of luck Peter with your evening - deserve it for all your efforts! To avoid any confusion over times etc I have published a rough programme for the comedy night pointing out that the first comedian will be on at 8.30 and the bar will be open until 1am.